Calabria has a vast range od wines, and each part of the countryside seem to have its own. Much appreciated by the ancient Greeks and Romans, Virgil and Pliny sing the praises of the fruit of the vine , and it is certain that in antiquity, Calabria was the land of wines (hence the name Enotria), and over a hundred varieties of wine were known there at the time of the Greeks. 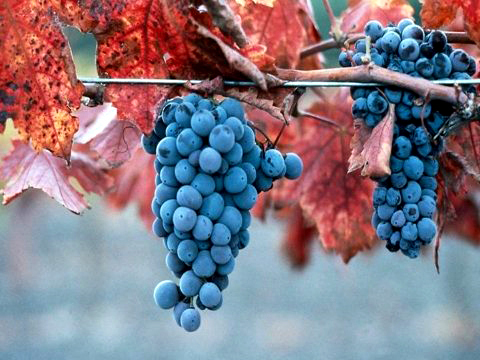 Over 90% of the region's wine production is red wine, with a large portion made from the Gaglioppo grape. 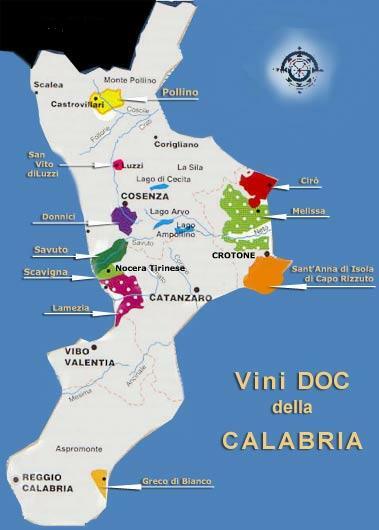 Calabria has 12 Denominazione di origine controllata (DOC) regions but only 4% of the yearly production is classified as DOC wine. 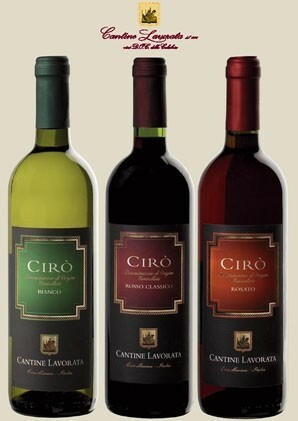 Some of the finest red wines come from Ciro. Generally speaking, Calabrian red wines are better than the white, and such is their strenght and body that they are widely used to " cut " a large number of Italian wines, including the renowned Barolo, as well as foreign. The controlled origin wines ( DOC ) in Calabria are now Ciro' and Melissa (upper ionian Catanzaro), Lametia (Piana di Lamezia Terme), Savuto (along the Savuto river, Cosenza province), Donnici (upper Crati Valley, Cosenza province) Graco di Gerace (a white wine, Locri area) and Sant'Anna (Isola Capo Rizzuto). Apart from these wines, of which the world famous Ciro' is outstanding and described as the oldest wine on earth, many other deserve a mention, and though well known, have not been accorded the DOC recognition. These include Pellaro, originating a few miles south of Reggio Calabria, known for its robust quality, flavor and strenght , Kalipea, made at Locri, golden in color; Limbadi (Catanzaro), a good table wine; Rossano , made in the area near the town, ruby coloured with a high alcoholic content; Verbicaro (Cosenza), from the Lao river basin. A curiosity is the Trasfigurato wine from Seminara , kept in terracotta containers and smoked. There are 100's of other wines, all good, and the search for Calabrian wines can be a fascinating pastime for visitors wishing to get to know Calabria , not only for what it is but for what it has to offer.